The average cost to remodel a bathroom is $8,000-10,500. This includes new fixtures (toilet, sink, shower, tub), tile flooring, new vanity, sink, countertop, shelving, plumbing and electrical work. Calculate an accurate price quote for your bathroom renovation based on square footage, trim level (quality), tile installation, and other project details. You will see estimates for basic, mid-range, and luxury bathrooms. The formula assumes that all new plumbing, electrical, and fixtures will be installed. Removal of standard old fixtures and installation of new drywall, tile flooring, and optional tile on all walls are also included in the estimate. You can choose 3 different trim levels - Basic (for rental apartments), Mid range (suitable for most homes) and Luxury. Keep in mind that the local cost of a bathroom remodel can vary as much as 20% above national average (for Pacific region) to 18% below national average for East South Central regions of US. Thus, to get location-based pricing, select your region from the options menu. For example, California will have the highest overall prices, with the average being $10,000-14,000 to update a medium size bathroom, in areas like San Francisco and Los Angeles. Southern states have some of the lowest labor rates, and average cost of a new bathroom there can be as low as $4,000-7,000 for the same size space. In the Northeast, areas like New York city, Boston, Washington D.C., etc. will have high rates that are overall similar to cities in California. A shower remodel starts at $2,300 and can go up to as much as $15,000, depending on what you have in mind. Tearing out a bathtub and putting in a new shower enclosure costs about $2,000-3,500. If you want to step it up in terms of luxury, the price to install a steam shower starts at $2,650 but can go as high as $5,000 - 8,000 if you want to add fancy frills, like aromatherapy pump, custom shower enclosure, mood lighting, etc. Making your bathroom handicap accessible can add $2,000-3,500 to the total. Putting in all new plumbing and moving around the sink and toilet can cost $3,000-5,500 extra. 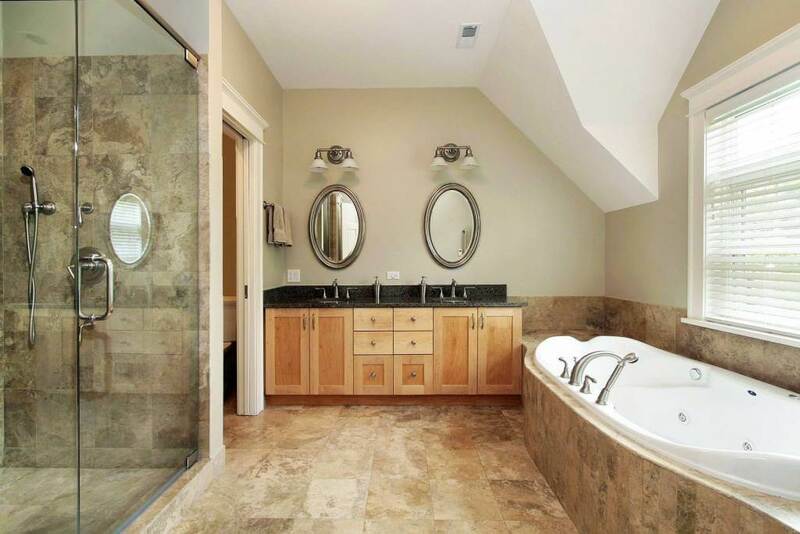 People spend the most money to remodel a master bathroom. Average reported prices start at $12,500 - 19,000. However, you may end up spending as much as $40,000-50,000, depending on the size of the space, moving walls, piping, quality of materials, desired level of luxury, and overall complexity of labor. Putting in a bathroom addition is also expensive. Average costs range from $20,000 to 35,000+, depending on the location and size of the addition, electrical, plumbing and HVAC work required, etc. Contractors who specialize in bathroom remodels charge $55-70 per hour, depending on local labor rates. Hiring a plumber costs $60-85 per hour. Electricians charge $65-90 per hour. Tile installers cost $35-70 per hour, depending on the type of work you want. Doing custom tile designs and mosaics can cost 3-4 times as much as laying regular wall or floor tile. Typically, if you are doing a major remodel, its best to hire a general contractor to manage and oversee all other types of labor that need to be done as part of the project. It is much more difficult and often more expensive to look for each type of contractor on your own. GC's have agreements with subcontractors in specific trades, and can get you an overall better price. Its best to hire pros who have a license, insurance and will pull all appropriate work permits from your town. What Is The ROI Of Remodeling A Bathroom? When planning how much you want spend to update your bathroom, consider the ROI or return on investment of this project. This is especially important if you plan to sell your home in the near future (2-5 years), or are currently prepping your house for sale. Indeed, refinishing an old bathroom is one of the most desirable projects around the house. It helps attract buyers and significantly boosts house value. In a hot housing market, a new bathroom can recoup over 100% of your investment! 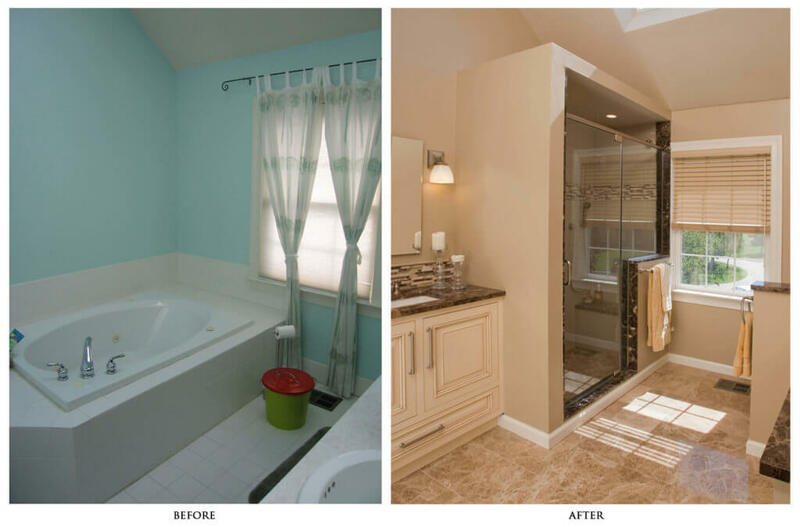 On average, a typical bathroom remodel offers about 62-65% return on investment. There is an important caveat here though: your gorgeous bathroom will not pay off, if it was completed instead of other more pressing projects, such as: heating, plumbing, HVAC, roofing, siding, etc. If all these items have been checked off, and then on top of this you make your bathrooms look spectacular, then sure, prospective buyers will be thrilled! How Much Should You Spend To Get The Best Returns? -If you have an old home, with only 1 bathroom, its best to invest money into building a second bathroom, instead of updating the one you have. While a bathroom addition typically doesn't recoup more than 50% of its value, this may be a necessary requirement for selling your home at a desirable price. - Consider your overall house value and sale price. If your house is worth $300,000, it does not make sense to drop $50,000 on a new bathroom. However, if your home is worth a couple of million, than you should spend $50,000-60,000 on your bathroom, to make it look on par with the rest of the house. - Research the value of homes in your neighborhood, especially those located right next to you. If you have an expensive home with very high-end updates, but your neighbors' houses are much more modest, it is wiser to invest less money and avoid having an over the top bathroom. Most likely you will not recoup its cost. Conversely, if you live in a high-end neighborhood, prospective buyers may be disappointed if they don't see luxury bathrooms in your home. The rule of thumb is: your total remodeling budget should not exceed the ceiling of your neighborhood home values, otherwise you will not get your money back. 1. Replace old, dated fixtures (sink, toilet, faucet, countertops): this is an easy, relatively inexpensive fix that goes a long way. 2. Invest into cosmetics rather than big changes: visuals impress the most, so spend money on new paint, wall and floor tile and other elements that have an instant positive impression. 3. Add good lighting: having different types of quality lighting in the bathroom can be a valuable bonus. 4. 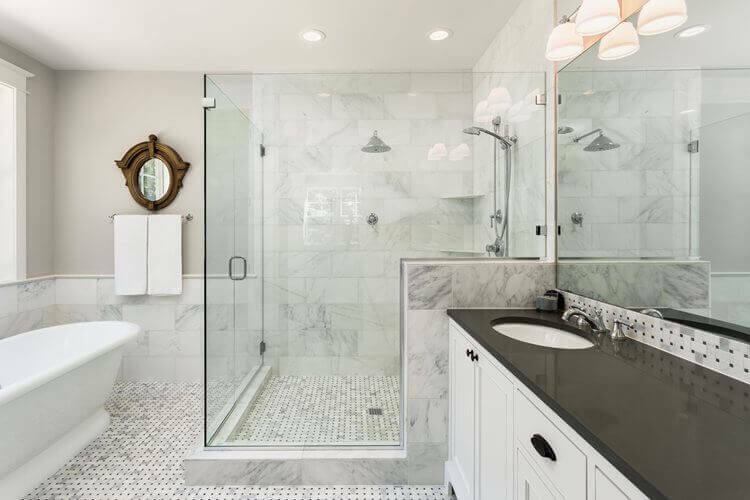 Replace the old tub with a large walk-in shower: this update remains extremely popular, as more and more homeowners appreciate high-end walk in showers, with steam and other bells and whistles, than traditional tubs (even expensive ones). However, if your home only has one bathroom, you should leave the tub in and replace it, if its old. 5. Install a quality double sink in a master bathroom: this is a highly popular update, especially in high-end homes. It is best to do some research and consult with your realtor what is most relevant to buyers right now, in your market. These particulars may not be the same across all regions in US. As you can see, there is a lot to consider before any bathroom remodeling project. While many homeowners can handle a few smaller bathroom renovation projects, many need help along the way. If you fall in the latter, be sure to connect with a local bathroom remodeling pro before any transformation is made. RemodelingCalculator.org is a participant in the Amazon Services LLC Associates Program, an affiliate advertising program designed to provide a means for sites to earn advertising fees by advertising and linking to amazon.com. Amazon, the Amazon logo, AmazonSupply, and the AmazonSupply logo are registered trademarks of Amazon.com, Inc. or its affiliates.